Address: Stagg Mill Cottage, Uplowman, Tiverton, EX16 7LY. Previously Head of Art in Wiltshire, Taught and designed stage sets at Blundell’s in Devon, Solo shows held at Knightshayes Court, A la Ronde and Tiverton Museum. Currently taking part in the New York Sketchbook Project (Mountains in Watercolour) which tours the States during the Summer months and the Twitter Art exhibit in Norway. 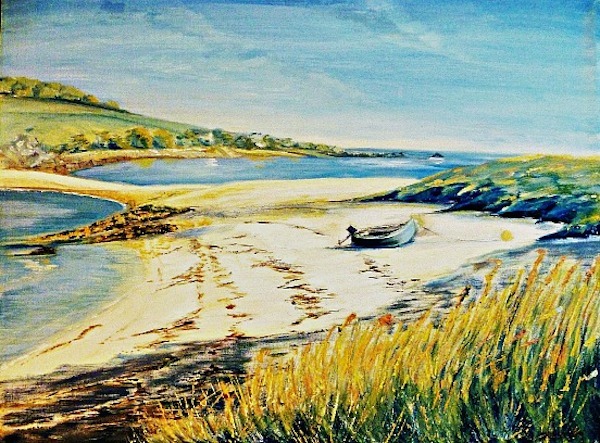 My oil paintings were once described as “making the world a more beautiful place”, I quite like thinking about that as I paint our stunning coastlines and countryside and feel blessed to live in Devon.